SCOTTSDALE. April 16, 2019—At tonight’s Nikola World event at WestWorld of Scottsdale, Nikola CEO Trevor Milton gave thousands of attendees a first peek into a global zero-emission future. The event was also live streamed to a world-wide audience via www.nikolamotor.com. 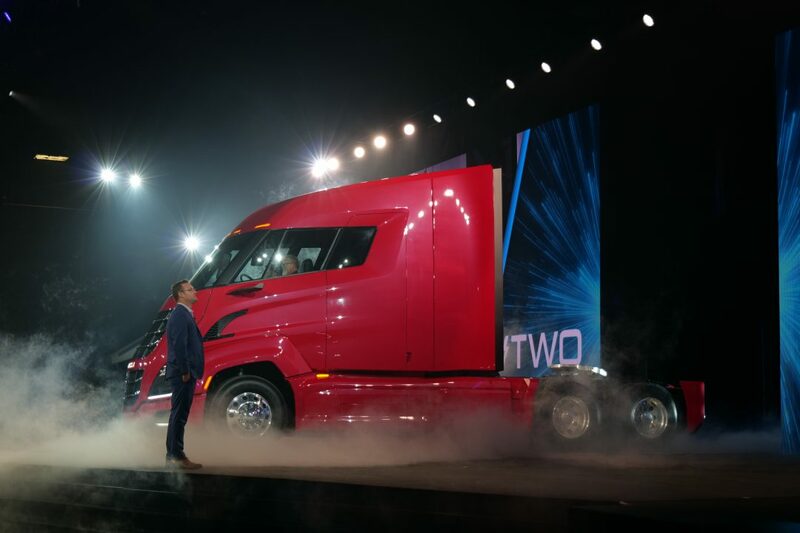 The evening began with Milton arriving on stage by the famous Budweiser Clydesdales, representing the company’s iconic client, Anheuser-Busch, that has ordered 800 class 8 zero-emission trucks from Nikola as part of its sustainability strategy. As part of the evening, Arizona Governor Doug Ducey discussed Nikola’s contribution to Arizona’s growing economy, adding 2,000 new jobs at their Phoenix headquarters, planned manufacturing plant and hydrogen and fuel cell R&D center. “Nikola is bringing zero-emission sustainability and technology to the water,” added Milton. “With WAV, you can feel the rush of power and acceleration in your chest, with the sound of the water and breeze in your ears. It’s zero impact and pure fun,” Darling added. Nikola’s Executive Vice President of Hydrogen Jesse Schneider discussed Nikola’s hydrogen fuel cell vision. The vision consists of the world’s first purpose-built fuel cell Class 8 truck, enabling more hydrogen storage, optimized placement of the powertrain, and a robust 70MPa hydrogen fueling network. “We recently opened our first hydrogen station at our Phoenix headquarters. We are leading the way and working with industry and other OEMs to develop hydrogen standards to enable fueling in less than 15 minutes. The goal is safety and interoperability, so that anyone can fuel at our station. This is a big deal,” he said. All of the Nikola products have been built for the future with autonomous driving hardware in place. At the conclusion of the night, Milton reflected on the small, but mighty, team that started Nikola five years ago in his basement with an idea. “We now have five products in development that will change transportation for the better,” he said. Nikola World will host more than 4,000 guests over two days, including hundreds of Nikola truck reservation holders. Nikola has partnered with Ryder System, Inc. and Thompson Machinery to offer world-class sales, service and warranty through their over 800 locations across North America. Nikola Corporation designs and manufactures hydrogen-electric vehicles, electric vehicle drivetrains, vehicle components, energy storage systems, and hydrogen stations. The company is bringing the nation’s most advanced semi-trucks to market with more than 13,000 trucks on preorder. Nikola is led by its visionary CEO Trevor Milton (Twitter: @nikolatrevor), who has assembled one of the most talented teams in the country to bring the Nikola products to market. The company is privately-held and headquartered in Arizona. For more information, visit nikolamotor.com or Twitter: @nikolamotor.